I am back! First off, sorry for my longer than expected absence. I had the opportunity of staying at the in-laws' for an extra week and jumped at it. I mean, a long lie in, fresh squeezed orange juice and perfectly brewed coffee, homemade marmalade on beautifully toasted bread doesn't come my way often... and a full week of this was too good to pass up! Yes, my in-laws rock! I had a blast in Terrace with my friend and family and wanted to take the opportunity to relax and recharge completely. But now its back to the real world again, and its catching up quickly. Aditi starts Junior Kindergarten early September, and its left me scratching my head as to where the time has gone. It feels like only yesterday I was toting around a 7 lb baby, and now I can barely pick her up without throwing my back out :-) So for the first time, I am back-to-school shopping, and I can tell you, this is one chore I will happily cross off my list of favourite things to do. Who knew there were so many people in Edmonton? And that they are all in South Common shopping? And they all have the kids in tow? Online shopping, here I come! So I decided to hide at home for a few days. Kay's been away on conference for a few days, and I decided to take the opportunity to tackle the steadily growing mound of courgettes, or zucchini as they are known here. When Kay planted that plant, I expected a couple of courgettes perhaps every a fortnight. The reality has been that I have been harvesting one every two days. Thank heavens we only have the one plant! You can practically watch these things grow, they are so quick and prolific. We've had everything from vegetarian chili to courgette pakoras. I grated and froze some, so I could use them to make zucchini bread in the winter. The neighbours are getting sick of them too! But I hate wasting any food, so I had to figure out what to do with the steadily growing pile in my fridge. Then Kay suggested pickling them. And I was like, why not? I mean, courgettes are pretty close to cucumbers, so if cukes can make dill pickles, why not courgettes? I looked up some recipes, and one of the concerns seemed to be that they would get mushy if pickled. But then I stumbled upon Judy Rodger's recipe from the Zuni Cafe Cookbook. And that sealed it for me, really. The Zuni Cafe roast chicken is simply the best thing I've ever eaten. So of course, I was quite keen to try out the courgette pickle recipe too. Plus, these were refrigerator pickles, so I wouldn't have to faff about with sterilizing and processing the pickles. So I made them. Now when I make pickles, I always pop a few slices into a small container, so I can sneak a taste before opening up a full jar. I cannot tell you how delighted I was with the taste of these pickles! And I am not even the pickle fiend in the family. The pickles were crisp as can be, to boot. I can see these going on everything from roasts to burgers. And I cannot wait. I adapted the recipe a little bit as I had more courgettes than the recipe asked for. Plus, I made a few more modifications, so I am posting it up here. The actual recipe is in the Zuni Cafe Cookbook that I had borrowed from the library, but I think I will have to invest in my own copy very soon, I love the recipes that much. 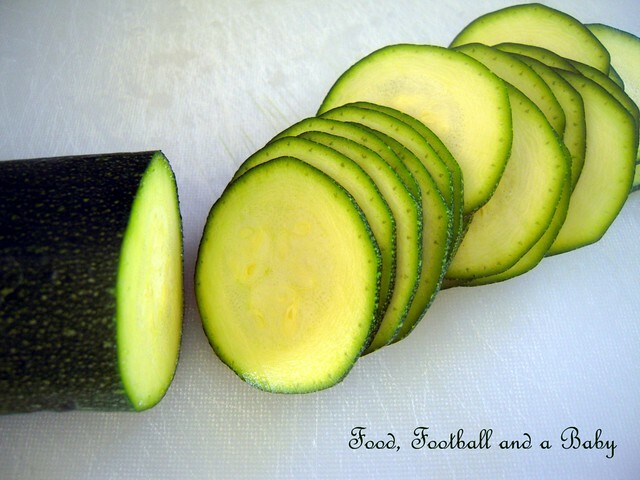 Thinly slice the courgettes into rounds. Ideally they would be sliced with a mandoline, but I don't have one. I was extra careful, and the courgettes were neatly sliced using a small serrated vegetable knife. Cut the onion in half and thinly slice it. Place the sliced onion and courgettes in a large bowl. Whisk the salt with some cold water, and pour it over the courgettes, gently stirring it in using your fingers or a spatula. Place the ice cubes in the bowl with the courgettes, then pour over enough cold water to cover the onion and courgettes completely. Keep aside for an hour. To make the pickling brine, put the vinegar, sugar, salt, mustard powder and seeds and turmeric in a large pot. Whisk together, and bring to the boil. Turn the heat to medium and simmer for about 3 minutes. Keep a sharp eye on this mixture as it can boil over very quickly (yes, I found this out from experience) One simmered, place aside to let it cool down until lukewarm. 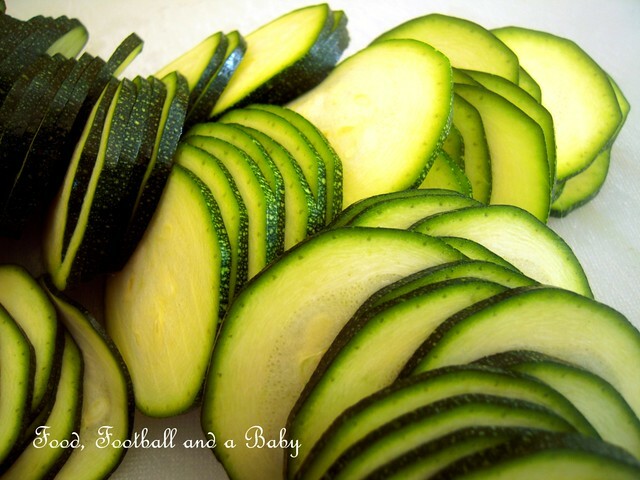 Drain the courgettes and onion, and dry them as thoroughly as you can using kitchen paper or dish towels. The less water on the courgettes, the crisper they will remain. 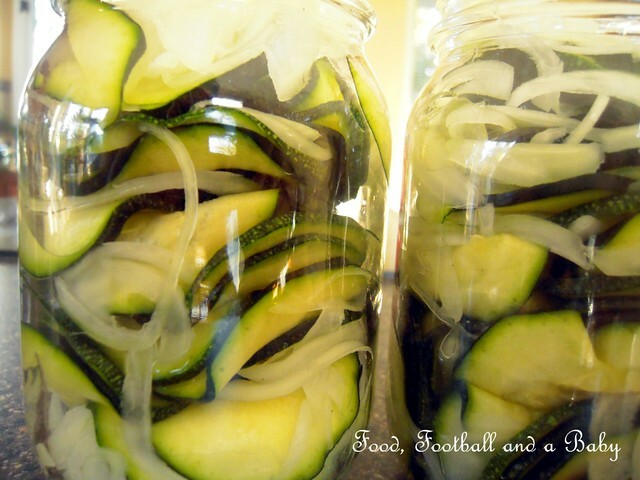 Carefully transfer the courgettes and onions into jars that have been washed with hot water and dried well. I stuffed two 500ml Bernardin Mason jars + a little was left over that I put into a small Glad container. Very carefully pour the just warm brine into the jars over the courgettes and onions, shaking the jars ocasionally to make sure the brine covers the vegetables completely. Screw on lids, and let cool completely before placing them in the refrigerator. Let them mature for a couple days before eating. I love Judy Rogers recipes! We ate the famous roast chicken at the Zuni cafe and visited the kitchen (there is a post of it on my site) and she was actually there that night. I saw her, but just missed getting to meet her. I wanted to buy the cookbook and have her sign it. Next time. This is a great recipe similar to Yum Yum pickes, in my mind. I am surprised the zucchini are crisp when they are hardly crisp right our of the garden. :) You know what I mean. 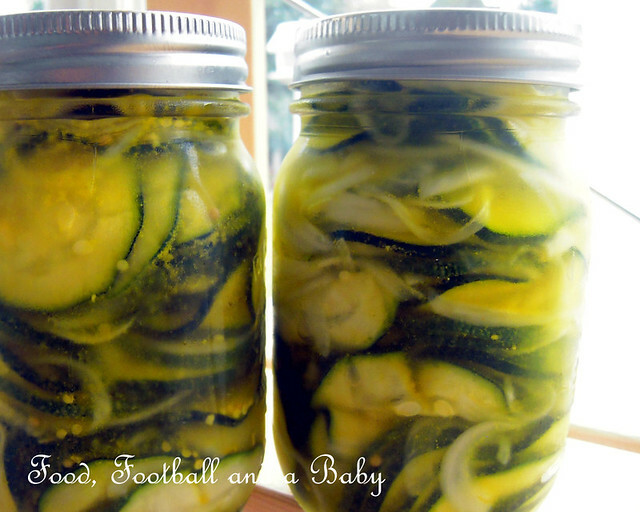 I didn't plant any this year, and am kicking myself, but this is an excellent fresh pickle side to make ahead for any summer bbq and I cannot wait to try it... I trust your palate completely! YUM! I just wish there was one that could be processed to be kept longer and remain as tasty over time. Michelle - what else have you been canning? This weekend I did 12 jars of applesauce to do apple butter later - or to use as is, roasted a TON (I am insane) or red peppers to freeze and make ajvar from, and made some beet pickles. I am on a roll. Clearly. And nuts, too. My zucchini were quite large, and I was also sceptical about them crisping up. But the salt and cold water bath seems to do the trick, and when I tried a slice, it had a nice satisfying crunch to it. I have beets coming up to pickle, and I am thinking of canning all the yellow beans that are just going mad in my garden. We don't have any fruit this year, unless I can persuade my neighbour to share his Bing cherries with me. He's going to give me apples though, which I am planning to cellar. But next summer we have raspberries and we are also planning to get a fruit tree of some sort... I can't wait! Nice idea. I planted 5 courgette plants - yes I've got a lot of courgettes. I could put the pickle in the fridge between the courgette chutney and the leftover slow-cooked courgettes. Now there's an idea. 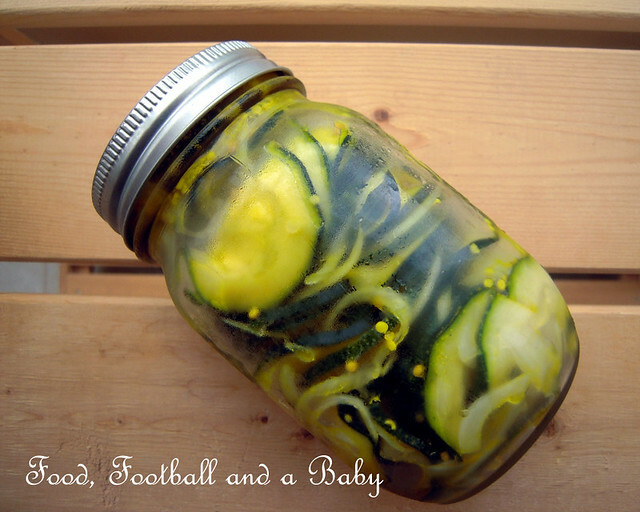 Even though our courgettes haven't done brilliantly well this year, I cold spare one to make a jar or two of these. I made piccalilli last year which sounds very similar, using courgettes, shallots and French beans, which was delicious, but I have no French beans this year. Think I will be making yours instead. Choclette, you should definitely try these. As they are refrigerator pickles, you don't really need a lot of them to make a jar or two. Mine are already getting decimated, and I have to remind my husband that they are supposed to last us until at least December. Do you have a picallili recipe you use? We loved it when we lived in the UK, would love to make some of my own here.